Twenty years ago the Union of Soviet Socialist Republics was starting to break up into sixteen successor states ("the Union of Fewer and Fewer Republics"), which made for exciting times. One immediate consequence of the collapse of the USSR was that the other nations of the world had to very quickly set up diplomatic premises in the newly independent states, which were hyper-eager to receive them, since a foreign diplomatic presence would help to solidify their new status. Problem was, almost all the available office properties back then were the ones being vacated by Soviet government agencies or the Soviet Communist Party. 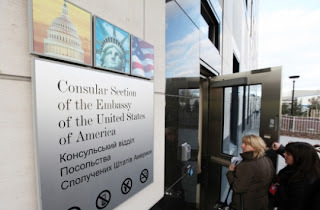 That was not good, since a former KGB headquarters would make a poor U.S. Embassy, for reasons of symbolism as well as practical considerations about eavesdropping devices. There would be bad ju-ju if our diplomats worked in buildings where dissidents had been tortured or killed. In Kyiv, the solution was to acquire the former headquarters of the Komsomol - the Communist Party Youth League - as a stop-gap solution until a larger and more suitable place could be found. I remember everyone figured that we would move into a new embassy office building in two or three years, five years at the outside. Today, after twenty years in the old Komsomol building, the U.S. mission finally moved into that new embassy compound. Following the 20th Anniversary of American-Ukrainian diplomatic relations celebrated on January 20, U.S. Ambassador John F. Tefft dedicated the new embassy facility in Kyiv today. Speaker of the Ukrainian Parliament, Volodomyr Lytvyn; Foreign Minister, Kostyantyn Gryshchenko; as well as Under Secretary for Management, Patrick F. Kennedy; Deputy Chief of Mission, Eric Schultz; and Deputy Director of the Bureau of Overseas Buildings Operations (OBO), Heather Townsend participated in the ribbon-cutting ceremony. Occupying a 10-acre site in the capital city of Kyiv, the multi-building complex is a platform for increased U.S. interaction with the Ukrainian people. The embassy’s permanent art collection celebrates the exchange of artistic expression between the United States and Ukraine through work by contemporary Ukrainian, American, and regional artists, curated by OBO’s Office of Art in Embassies. The new embassy incorporates numerous sustainable features, most notably advances in engineering design to maximize efficiency and minimize energy use, a green roof system, and rain gardens which pre-treat stormwater before it is infiltrated on-site. The compound is registered with the Green Building Certification Institute and is entering the formal review process; it is the first LEED® registered project in Ukraine. B.L. Harbert International of Birmingham, Ala., constructed the project, which was designed by Page Southerland Page of Arlington, Va. The $247 million project generated hundreds of jobs in both the United States and Ukraine. 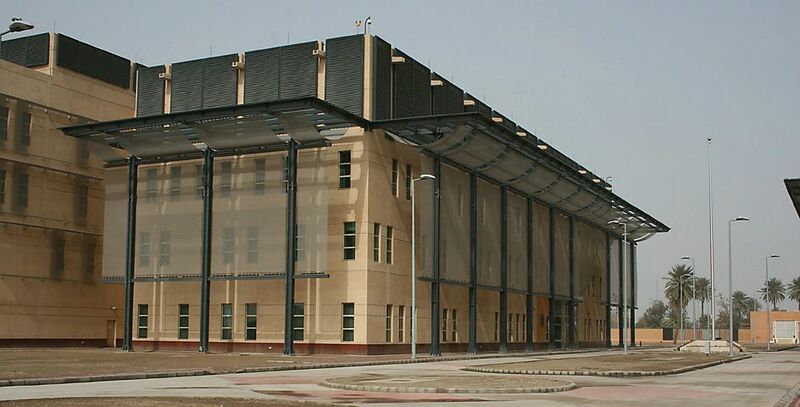 Since 1999, as part of the Department’s Capital Security Construction Program, OBO has completed 88 new diplomatic facilities and has moved more than 27,000 people into safe, secure, and functional facilities. OBO has an additional 41 projects in design or construction. By the way, the new compound in Kyiv was built on the site of what had formerly been a huge junkyard. No bad ju-ju there. What Does It Take To Be A "Global Crisis"? Passport asks a real good question today: should Central America's drug violence be considered a global crisis? It sure seems to me that it ought to be considered a global crisis. If it isn't, then, what would it have to do to qualify? Passport references a report from the U.N.'s International Narcotics Control Board to describe the state of drug-related violence in Central America (briefly, there are unprecedented levels of drug trafficking, transnational and local criminal gangs, fighting between and within drug trafficking and criminal organizations operating out of Colombia and Mexico, widespread availability of firearms, and the world's highest homicide rates), and then it offers a comparison with Syria. Just how bad is it? To put things in perspective, in Syria, where the the United Nations is debating imposing international sanctions and many are urging humanitarian intervention, an astonishing 7,500 people are estimated to have been killed in the last 11 months. With Syria's population, that's almost 37 deaths per 100,000 people. 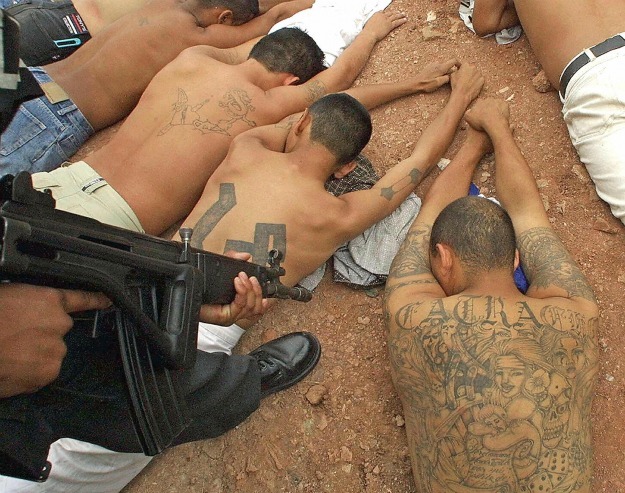 By comparison, Honduras has a murder rate of 82.1 per 100,000, the highest in the world. It's followed by El Salvador at 66 and Jamaica at 60 -- all driven primarily by drug violence. With only 8.5 per cent of the world population, Latin America and the Caribbean account for 27 percent of homicides. I don't mean to minimize the tragic violence of the Middle East, but it's a bit astonishing how little [attention] this carnage closer to home gets in U.S. political circles, particularly since, as the world's largest drug market, North Americans are directly implicated in it. Seven of the top ten national homicide rates reported in the U.N.'s global homicide study are in Central America and the Caribbean. In addition to super-high Honduras, El Salvador, and Jamaica, the others are: Guatemala, Belize, Venezuela, and St. Kitts and Nevis, all with around 40 homicides per 100,000 people. For context, the homicide rate in the U.S. is 5 per 100,000, the same as the rate for Europe as a whole. All of that carnage is fueled by drug trafficking. With so much slaughter going on year after year, why doesn't Central America get even a fraction of the humanitarian attention the international community is currently pouring all over Syria? The Tipping Point In Afghanistan? How can the killing of two American military advisers inside the Ministry of Interior headquarters building, coming at the end of a week of rioting and outrage directed at all Western presence in the country, including the killing of two other U.S. soldiers by an Afghan policeman on Thursday, not be a tipping point in our over-long and increasingly pointless commitment to maintain a NATO coalition mission in Afghanistan? The New York Times story on today's terrible incident (2 Americans Killed as Afghan Unrest Enters Fifth Day) seems to be the best of the still-pretty-thin accounts to be published so far. It gets right to the point by calling into question "the coalition's entire strategy of joint operations with Afghan forces." The order [to immediately pull all military advisers out of Afghan ministries] by the NATO commander, Gen. John R. Allen, came on the fifth day of virulent anti-American demonstrations across the country, and it was a clear sign of concern that the fury had reached deeply into even the Afghan security forces and ministries working most closely with the coalition. Although there was no official statement that the gunman was an Afghan, in an e-mail sent to Western officials here from NATO headquarters the episode was described as “green on blue,” which is the military term used here when Afghan security forces turn their weapons on their Western military allies. The killings, which happened within one of the most tightly secured areas of the ministry, add to the drumbeat of concern about a deepening animosity between civilians and militaries on both sides that had led to American and coalition forces being killed in increasing numbers even before the Koran burning ignited nationwide rioting. And the pullout from the Afghan ministries suddenly called into question the coalition’s entire strategy of joint operations with Afghan forces across the country, although General Allen said NATO was still committed to fighting the war in Afghanistan. ISAF has said very little about the incident, and released no details. However, I notice that ISAF spokesmen and General Allen have consistently referred to the attacker in the singular (using the words "the person" and "the perpetrator" and "the individual," and never 'the person or persons') which makes me think that someone has a fairly good idea of what happened. But maybe I'm reading too much into that wording. BBC has a few unsourced additional details, such as that eight shots were fired, that the shooting occurred in the MOI's command and control center, and that "the incident followed a verbal clash." The WaPo's story likewise said that "one of the [unnamed Afghan] officials noted that the shooting occurred inside a secure room at the ministry that Afghan staff do not have access to." I've seen many similar comments today to the effect that NATO advisers work in a small compound-inside-the compound at MOI headquarters. I'm sure that a personal security detail must have accompanied the two victims to MOI headquarters, yet there is no mention of them or of any shots they fired in defense. That seems to reinforce reports that the shooting took place inside a secure inner area within MOI headquarters. 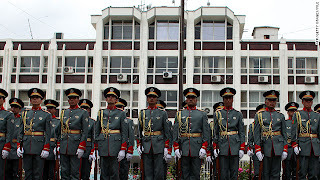 I assume the advisers would have been closely covered by their protective detail when they were arriving and departing MOI and exposed to armed Afghan policeman and guards, especially after last Thursday's fatal shooting by an enraged Afghan policemen of two U.S. soldiers in the province of Nangarhar. 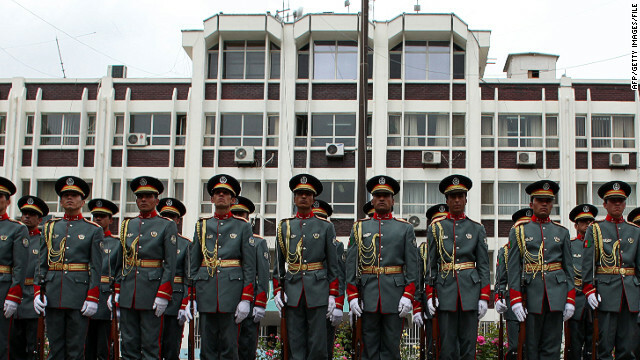 We can be sure that MOI headquarters has plenty of perimeter security, entry access controls, visitor screening, and identification/accountability of everyone in the building. The odds that this attack was committed by an outsider, as the Taliban has claimed, are vanishingly small. Moreover, the attacker was someone authorized to be armed inside the building, or else was able to access a weapon after he got there. He was almost certainly an insider, and maybe even an Afghan counterpart to the NATO advisers. The attacker was able to walk away afterwards unhindered, leaving the [purportedly] secure interior area of the headquarters and going back into the surrounding general work area, and maybe even outside the building before it was locked down. How come? Most likely because he is a senior official who could just blow past MOI access controls and security. Or else he is someone being assisted by senior MOI officials who are now hiding him. The attacker did not leave behind a fall guy to take the blame; for instance, a low-level guard who could be killed and left at the scene with the murder weapon in his hand. How hard would it have been to do that, and avoid a lot of consequences for the MOI? (Maybe that's a cold-blooded idea, but don't tell me the Afghan MOI isn't full of people who would do exactly that without a second thought.) That suggests the attack was spontaneous and unplanned, in accordance with the BBC's report about a "verbal clash" preceding the shooting. I've seen no statement from the U.S. Embassy in Kabul as to whether it, like ISAF, will withdraw its presence from Afghan ministries and severely limit any movements outside the embassy. I assume it will. What else can it do? So, I guess we'll be conducting the very best diplomacy we can during this crisis without leaving the embassy compound. Wearing a lime green shirt, the Secretary of State was placed in the middle of the foreign ministers - all dressed in crisp white shirts - for a G20 'family photo' in Los Cabos, Mexico. For the photograph, Clinton was joined by leaders including the EU's foreign policy representative Baroness Catherine Ashton, Mexico's Patricia Espinose and South Africa's Maite Nkoana-Mashabane. But it was an outfit not unexpected from the Secretary of State, known for her loud-coloured, boxy jacket and trouser suit combinations. She raised eyebrows on a state visit to Barbados in June 2010 when she chose a gaudy bright orange trouser suit to meet the country's vice president. The Department of State was unable to identify a dress code which the Secretary of State had missed. Why didn't the State spokesman tell the press that we in the U.S. of A. have a native dress code that proscribes wearing white after Labor Day? That might have been better than nothing. What a bunch of wet blankets we have in this administration! 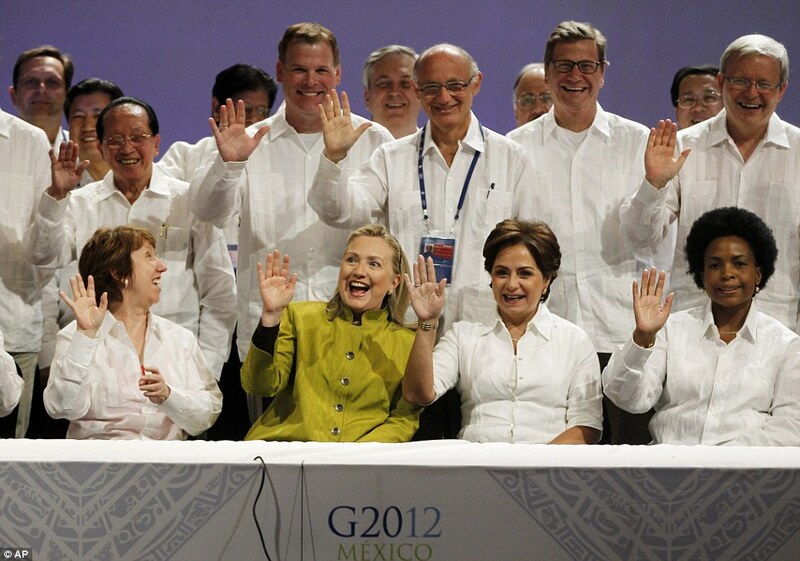 First it was Obama, refusing to do a 'silly shirt' group photo at all as host of the Pacific economic summit conference, and now Hillary refusing to put on a Guayabara shirt. So strange, especially when you remember how her husband was always the life of the party. I don't understand why none of his joyously unrestrained behavior has ever rubbed off on her. Aren't long-term couples supposed to resemble each other? I'm looking for one of those small brass signaling cannons that fire black powder charges, and if I get one, I will definitely risk the wrath of the Fairfax County authorities by firing a salute to President George Washington from the back deck of my house on the occasion of his birthday. It seems like the only really appropriate form of observance. Washington was "first in war — first in peace — and first in the hearts of his countrymen" (read the whole eulogy here), and that applies to today's Federal holiday, as well. 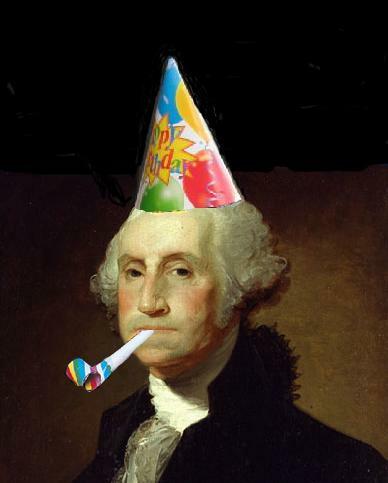 It is officially and legally "Washington's Birthday." There is no such holiday as "President's Day," even if a million sales ads say otherwise. At the recommendation of [a special joint committee], chaired by Henry Clay of the Senate and Philemon Thomas of the House, Congress adjourned on February 22, 1832 out of respect for Washington's memory and in commemoration of his birth. The SecState used to read the Farewell Address before a joint session? The address in which Washington advised us to have friendly relations and trade with all nations but to avoid foreign wars and entangling alliances? Advice that we pretty much followed up until a generation or two ago? The great rule of conduct for us in regard to foreign nations is, in extending our commercial relations, to have with them as little political connection as possible. So far as we have already formed engagements, let them be fulfilled with perfect good faith. Here let us stop ... It is our true policy to steer clear of permanent alliances with any portion of the foreign world ... Taking care always to keep ourselves, by suitable establishments, on a respectably defensive posture, we may safely trust to temporary alliances for extraordinary emergencies. I say we ought to have SecStates read that advice again. Foreign Policy's Passport blog asks a good question after this week's arrest of yet another hapless jihobbyist: how many more times can the FBI get would-be terrorists to fall for this? We may well have an inexhaustible supply of domestic and imported Islamists who are willing, but not quite able all by themselves, to bomb our government buildings, metro stations, and public gathering places. But will they keep relying upon helpful strangers who offer to equip them with inert explosives and non-functional firearms? I think they will, indeed, keep falling for the FBI's act. First of all, it is a plain statistical fact that fifty percent of every group will be below average. (Try to find an exception to that rule.) And, in the cases we've seen so far, the FBI's stingees seem to have come from somewhere on the left-hand side of the I.Q. curve. But I wonder if it's the best use of USG resources to play out these undercover comedies for months or years before arresting, or even just deporting, the dim bulbs. A would-be suicide bomber was arrested on Capitol Hill today after accepting what he thought was an explosive vest from undercover agents. Roll Call notes that the story is similar to that of Rezwan Ferdaus, who was arrested last September in the midst of a plot to attack the Capitol with a remote-controlled aircraft. Ferdaus was also in communication with FBI agents posing as al Qaeda members. The case is also similar to that Farooque Ahmed, who thought he was going to blow up the DC Metro system in 2010, Mohamed Osman Mohamud, who thought he was going to blow up a Christmas tree-lighting ceremony in Portland Oregon in 2010, David Williams, who thought he was going to blow up a Bronx synagogue in 2009, and the "Fort Dix Five," who thought they were going to attack a New Jersey military base in 2006. The increasing frequency of these operations is bound to raise some questions about whether law enforcement agencies are pushing along the development of plots that the individuals involved might never have acted on without the longterm encouragement of their "al Qaeda contacts." The other question is just how many times the FBI can get would-be terrorists to fall for this. In this week's case, the martyr manqué was a Moroccan who entered the U.S. on a short-term tourist visa in 1999 and never left. Evidently, he is touring still. According to the criminal complaint, he came to the FBI's attention one year ago, at which point he was living in a rented room on a dead-end street in Arlington, Virginia, and probably couldn't have afforded a good meal of kabobs and rice. It must have become clear to the FBI after just a few weeks that this sad-sack shahid had no intelligence value. If he could have come up with any genuine al Qaeda contacts, he wouldn't have needed to be spoon-fed every part of his planning, targeting, and weapons by his FBI handlers. As a taxpayer, I say let's stop toying around forever with these guys. Charge them with conspiracy, or crossing a state line with intent to commit mopery, or any of a thousand other potential offenses, and be done with them. The FBI must have better things to do with its time and manpower. If A Campaign Promise Falls In A Forest, Does Anyone Remember It? A columnist for Foreign Policy's Election 2012 Channel had an article yesterday asking "how did liberals end up supporting the Obama administration’s continuation of George W. Bush's secret war on terror?" For example, the continuation of Bush administration policies on killer drones and indefinite detention of terrorists. That's a good question. His answer is that "at the same time that Americans want to maintain current policies on drones and detention they are also strongly supportive of returning troops home from Afghanistan." For Obama, as he winds down the war in Afghanistan, "maintaining the current policies on detention and drones is a nice back-up strategy: not only is it an effective way to fight the dwindling groups of jihadist terrorists, but it limits the administration's political exposure if something terrible does happen." None of this should come as a huge surprise if one looks closely at Obama's rhetoric from the 2008 campaign. Many of the administration's liberal critics on the left have strong memories of Obama blasting the Bush's civil liberties record. They recall Obama's pledge to close Gitmo, extend habeus corpus to terrorists, end torture and, in general, turn the page from the worst excesses of U.S. foreign policy during the Bush years. But they have a slightly selective memory. Indeed, one is hard pressed to find many examples of candidate Obama pledging to close Guantanamo (though that was clearly and unequivocally his position). He didn't mention it, for example, at the acceptance speech at the Democratic National Convention in Denver in 2008. Q: What priorities or goals would you establish for the development of existing or new international legal regimes? A: The next president will have to prioritize restoring our traditions of adherence to international legal regimes and norms ... As president, I will close Guantanamo, reject the Military Commissions Act, and adhere to the Geneva Conventions. Our Constitution and laws such as our Uniform Code of Military Justice provide a framework for dealing with the terrorists. STEPHANOPOULOS: You also agreed on Guantanamo when you say you want to shut it down. You say you're still going to shut it down. Is it turning out to be harder than you expected, will you get that done in the first 100 days? OBAMA: It is more difficult than I think a lot of people realize and we are going to get it done [balancing the rule of law with security concerns]. STEPHANOPOULOS: So not necessarily first 100 days. OBAMA: That's a challenge. I think it's going to take some time and our legal teams are working in consultation with our national security apparatus as we speak to help design exactly what we need to do. But I don't want to be ambiguous about this. We are going to close Guantanamo and we are going to make sure that the procedures we set up are ones that abide by our constitution. That is not only the right thing to do but it actually has to be part of our broader national security strategy because we will send a message to the world that we are serious about our values. 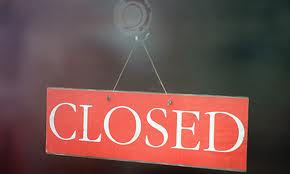 As things turned out, the Obama administration found it a bit too hard to close Gitmo. The WaPo has a detailed autopsy on how that campaign promise died. I, for one, consider it a good thing that Gitmo has stayed in operation. But no one can credibly claim that Obama dd not make that promise a central part of his campaign. Even dying is being outsourced here ... [the Afghanistan conflict] is a war where traditional military jobs, from mess hall cooks to base guards and convoy drivers, have increasingly been shifted to the private sector. Many American generals and diplomats have private contractors for their personal bodyguards. And along with the risks have come the consequences: More civilian contractors working for American companies than American soldiers died in Afghanistan last year for the first time during the war. The war in Afghanistan is actually not so unusual in that regard as many commentators seem to think, because the U.S. military has used contractors extensively going back to before World War II. The Defense Base Act, which provides insurance coverage for civilian workers on defense contracts overseas, and which is cited several times in the NYT article, was passed in 1941. So, military contracting in war, and private sector casualties, are nothing new. 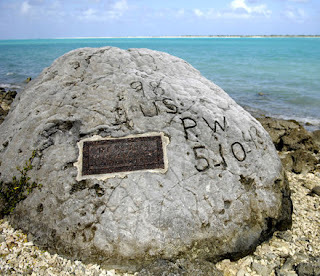 To take one example, there were some 1,600 military contractors on Wake Island in the Pacific when the Japanese Empire attacked Pearl Harbor on December 7, 1941. Most of the contractors were from Morrison Knudson, a large construction company that was basically the KBR of its day. When the garrison on Wake surrendered to the Japanese on 23 December, the civilian contractors were taken away as prisoners of war along with the military, except for some who were kept on Wake to build fortifications for the Japanese. When those fortifications were finished, the Japanese executed the civilian prisoners. One of the men escaped briefly and etched a message on a coral rock to mark the spot where the Japanese killed "98 U.S. [civilian] P.W. 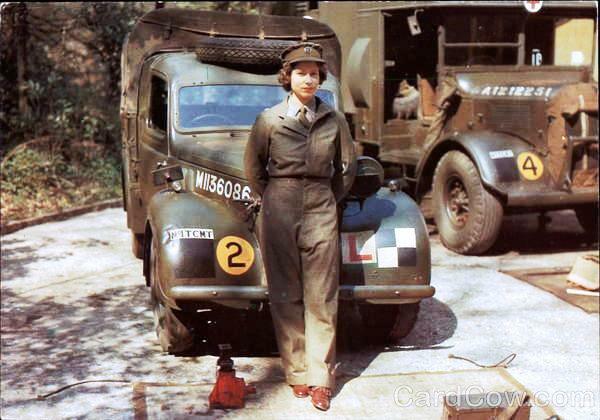 5-10-43." See more details about the incident here. A little historical context always helps me to place the news in perspective. There is something that bugs me about that New York Times story - the one with the entertaining tidbits about wilted lettuce and rationed chicken wings - and it has to do with the photo that accompanied the story. That's it, above. The story also had a slideshow consisting of photos taken in the nicely appointed chancery, staff apartments, dining hall, pool, gym, and tennis courts, all of which give the impression of an up-scale resort. But nowhere did the Times comment on those big shades that cover the tops and sides of the compound's buildings. What are those things? Over-sized sunscreens? There is no reason to be coy about them, since they have been mentioned rather extensively in official documents that are publicly available. They are 'overhead cover' structures, and they are there to protect building occupants from indirect fire weapons such as mortars and rockets. Those weapons have been impacting on the embassy compound all along, ever since it was being constructed. You could Google it. "Overhead cover is a necessity to protect against the threat of indirect fire at vulnerable office, housing, recreational and dining facilities." So on the one hand, we have the NYT's photos of embassy staffers in the pool and the tennis courts, and turning up their noses at unsatisfactory salad in the dining hall. But on the other hand, you have to use your imagination to appreciate that those U.S. government employees are living the good diplomatic life in a place where every now and then an anti-personnel weapon detonates outside. I would call that a lifestyle trade-off. 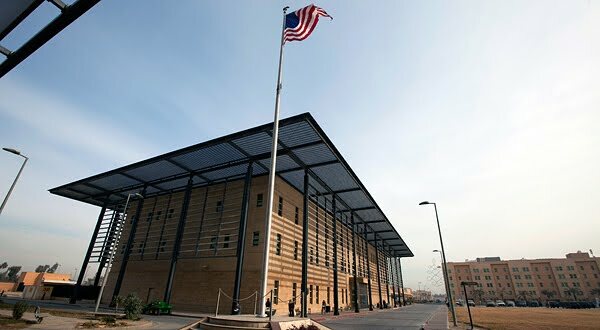 Downsizing the U.S. Mission in Baghdad isn't really about rationing chicken wings in the embassy's dining hall after all, despite yesterday's New York Times story. Instead, it's all about the reducing the footprint, according to remarks by Thomas Nides, Deputy Secretary for Management and Resources, at a press teleconference today. 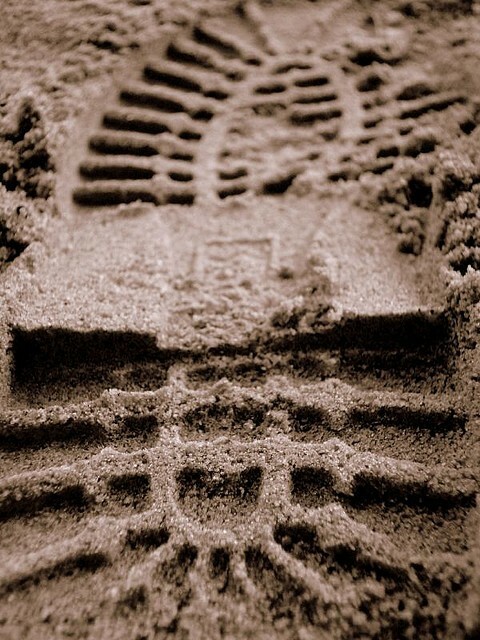 He said "footprint" seven times. We are currently wearing men's size 20 quadruple-E extra wides, or something like that. But, if we replace enough third-country security contractors with Iraqis, buy our groceries in the local market, and always, always, always re-think our engagement (Deputy Secretary Nides also said "engagement" seven times) we will eventually fit into a more nearly normal shoe. Read the press conference transcript here. 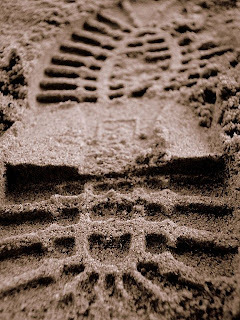 Evidently, most of this footprint reduction will come about by hiring fewer foreign (i.e., non-Iraqi) security contractors and replacing them with local hires. That will help in at least two ways. First, it will eliminate a leading source of aggravation for the Iraqis. Second, the mission will not have to house and logistically support so many contractors, since our local hires will go home after their shifts are over, just like a normal local guard force does at a normal mission. So as we proceed over the next year, and as we look at our mission set and look at what we’re trying to achieve on the diplomatic side, my hope is, is that we’ll conclude over – in the period of time that we can consolidate some of the locations and space, and that will allow us to rely more upon local Iraqi contractors. But the most important thing is what we’re going to do is we’re going to be studying it, we’re working on it, we’re going to work very closely with our staff at our – in Baghdad and around the country, and we’re going to work with the Iraqis. They – we are a team working closely with them as we look at this diplomatic mission now and into the future. Americans can rest assured that we have our top guys "working on it." If you are an American in Peshawar, you have more reason than most of us to want to get away. And that place where everybody knows your name is called the Khyber Club. PESHAWAR, Pakistan — As U.S.-funded Afghan jihadists battled the Soviets in the late 1980s, the unassuming American-run bar in this ancient frontier city bulged with gossiping foreigners. Today, with another Afghan conflict winding down, the watering hole practically echoes with emptiness. Through it all, Khan Afsar, the Khyber Club’s unlikely bartender, had a front-row seat. But Afsar did not actually have a seat in his spot behind the bar, and all the standing recently became too much to bear. So Afsar has stepped down after nearly 25 years of six-day workweeks that he says left him with admiration for Americans, a rare sentiment in Peshawar and in Pakistan at large. As a recent Saturday evening shift began, a lone Canadian patron sipped beer at the bar and predicted that the crowd was unlikely to improve. The scene seemed a metaphor for U.S.-Pakistan relations, which boomed with cooperation during the Afghan resistance but now gape with mistrust. Yet Afsar himself is a symbol of the ground-level relations between Americans and Pakistanis, which, despite the diplomatic tensions, are typically far more amiable than sour. 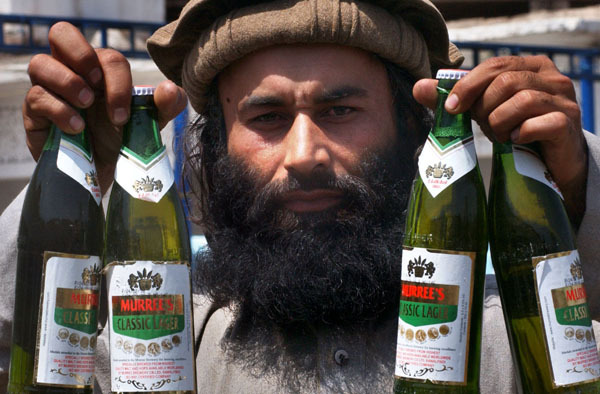 Over the decades, Afsar — a devout Muslim who never tried alcohol — served as a steadfast and good-natured ambassador for Pakistan, building a trail of admirers now scattered around the globe. Though U.S.-Pakistan relations ebbed after 1990, the club kept up, and so did Afsar, always adhering to his daily prayer schedule. The bar expanded. The tennis court was replaced by a swimming pool. Things began changing about five years ago, as Islamist militants expanded their reach and launched attacks in northwest Pakistan. Hostility toward Americans rose, and many international organizations withdrew foreign workers to Islamabad, the capital. The club’s security walls multiplied, and more American customers sported beards and tattoos, said Yusuf Ghaznavi, a Pakistani American who has been a fixture at the club for two decades. Against that backdrop, the club has become more of a lifeline, recent patrons said. Three U.S. troops who were killed in a roadside bombing in northwest Pakistan in 2010 were mourned at the Khyber Club, said one U.S. diplomat stationed there then. Afsar also served as a lifeline, the diplomat said — a historian and a middleman who could always fulfill orders for the perfect Pakistani carpet or shawl. Afsar dismisses the plaudits, saying he just did his job. He insists the work never brought him threats from militants or hounding from Pakistani intelligence. Afsar, a witness to decades of globe-shaking history, would hazard no guess about the future of the club or Afghanistan. U.S.-Pakistan relations, he thinks, will soldier on. Well, Kentucky Fried Chicken has come to the Palestinians. H/T to the Snake's Mommy for bringing the news to my attention. Has anyone told Tony Blair? On the culinary level, I never can understand the demand for American-style fast food in Arab cities. For my money, Arabs already have the world's best native fast food. Nevertheless, KFC's franchisee in Ramallah didn't have to invent* a Palestinian market for The Colonel's Original Recipe, since it's already familiar to locals who have traveled around the region. But on the political level, this development might finally test Thomas Friedman's kinda-kidding-but-kinda-serious Golden Arches Theory of Conflict Prevention, which postulates that no two countries that both have McDonald's have gone to war against each other since each got its McDonald's. 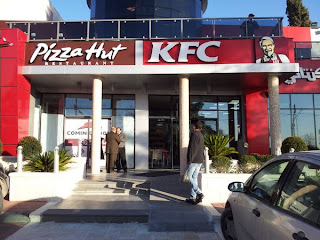 The Palestinians don't happen to have McDonalds, so far as I can tell, but KFC will substitute very nicely. Call it Friedman's KFC Korollary. Friedman's theory says that when a country reaches a certain level of economic development and has a middle class big enough to support American-style material consumption, its people will than prefer to wait at drive-up windows for greasy buckets of chicken rather than, say, fire home-made rockets into Israeli towns. I have my doubts about that. But, now it's kosher wings eyeball to eyeball with halah extra-crispy chicken strips, and anybody's guess who'll blink first. I believe Queen Elizabeth is the last surviving head of state who served in World War II, and that is all the reason this republican needs to notice that today is the 60th anniversary of her ascension to the British throne. The United States has suspended operations of our Embassy in Damascus as of February 6. Ambassador Ford and all American personnel have now departed the country. The recent surge in violence, including bombings in Damascus on December 23 and January 6, has raised serious concerns that our Embassy is not sufficiently protected from armed attack. We, along with several other diplomatic missions, conveyed our security concerns to the Syrian Government but the regime failed to respond adequately. Ambassador Ford has left Damascus but he remains the United States Ambassador to Syria and its people. As the President’s representative, he will continue his work and engagement with the Syrian people as head of our Syria team in Washington. Together with other senior U.S. officials, Ambassador Ford will maintain contacts with the Syrian opposition and continue our efforts to support the peaceful political transition which the Syrian people have so bravely sought. As the Secretary told the Security Council on January 31, we continue to be gravely concerned by the escalation of violence in Syria caused by the regime's blatant defiance of its commitments to the action plan it agreed to with the Arab League. The deteriorating security situation that led to the suspension of our diplomatic operations makes clear once more the dangerous path Assad has chosen and the regime’s inability to fully control Syria. It also underscores the urgent need for the international community to act without delay to support the Arab League’s transition plan before the regime’s escalating violence puts a political solution out of reach and further jeopardizes regional peace and security. It's big, it's green, it's full of garbage, and you just know that it stinks. 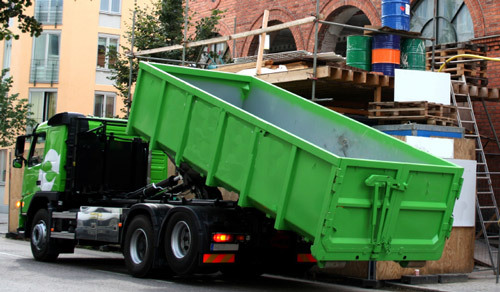 The White House backed this dumpster up to Capital Hill last night - beep, beep, beep - and dropped off 313 pages of documents about its pungent decision to give a half-billion dollars in taxpayer money to a failing solar panel manufacturer. Who do they think they're fooling with these late-night document dumps? Does the White House think no one will notice? Well, the White House might be right about that, since I saw absolutely nothing about last night's dump in this morning's Washington Post or in the New York Times. Amid threats by a top House Republican to pursue contempt charges, the White House on Friday sent lawmakers more internal documents related to the $535 million loan guarantee to failed solar firm Solyndra. The White House, in providing the 313 pages of documents, again denied that approval of the loan guarantee in 2009 was influenced by politics, an allegation that Republicans have repeated for months. Friday marked the third time that the White House provided internal documents to the House Energy and Commerce Committee since Republicans on the panel issued a subpoena for all Solyndra communications in November. This particular Solyndra dump may have been the third after the subpoena was issued, but it was the fourth one to occur on a Friday night, according to my count. The first was on October 7, 2011, followed by one on November 4, 2011, and then by another on January 13, 2012. The January dump was on a Friday before a three-day Federal weekend, so I guess those documents needed to be buried extra deep. If the White House is giving up embarrassing e-mails, you know it's a Friday. You might wonder, what could possibly be so embarrassing about all the green energy loan guarantee stuff that the White House was pushing so enthusiastically just last year? Well, there were Obama fundraisers advocating for loans in which they had direct personal financial interest. Such as Steven Spinner, who was appointed to a job overseeing the Department of Energy's loan guarantee program despite the fact that his wife's law firm received $2.4 million in federal funds for legal fees related to the Solyndra loan. If the parties involved in that deal had been a Republican fundraiser, his lawyer-wife, and Haliburton, would any Democratic Congressman accept it just because the administration issued a favorable ethics opinion? And there was also the matter of the Energy Department restructuring the Solyndra loan on the eve of the firm's bankruptcy so as to prevent the taxpayers from having any claim on the firm's assets after it went bust. That's bad enough all by itself, but they also did it without first seeking a Justice Department opinion on whether that action would violate the law governing such loans. Will there be more green document dumps? You can bet there will be. According to CBS News, there are eleven more green energy firms that are going bankrupt, just like Solyandra, after the administration approved them for more than $6.5 billion in federal loans.